The phone rang the day after Kathleen Weinstein of the Pine Mountain community returned from a magical trip to Spain and France with her husband, Mel. 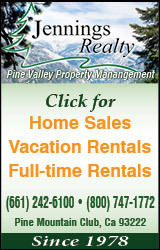 They had reserved tickets for an event on July 1 at the Tejon Ranch Conservancy. It involved a challenging hike—a good opportunity to work off some of those delicious Parisian pastries. The call was from an acquaintance who works for the Conservancy. As a couple, the Weinsteins had been discussing donating money to the nonprofit Tejon Ranch Conservancy. Weinstein searched her mind to think what the caller could be talking about. 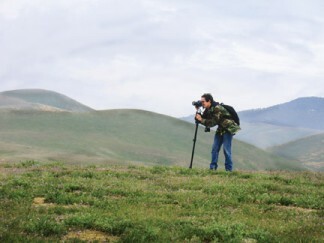 Frazier Mountain High School student Ben Miseroy on a photo safari in 2016 with Tejon Ranch Conservancy scientists, exploring the vast landscape that may be converted to Centennial development. Former Governor Arnold Schwarzenegger (with Natural Resources Defense Council’s Joel Reynolds and Tejon Ranch CEO Robert Stine) spoke at the press conference in 2008 to mark the “Big Green” and Tejon Ranch Company accord. 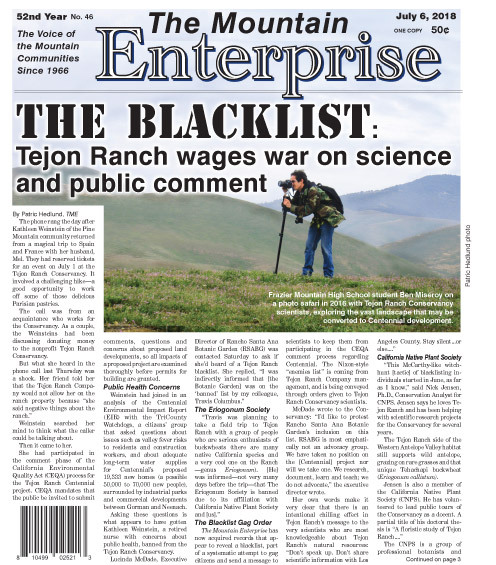 Tejon Ranch Conservancy was introduced as an independent nonprofit. 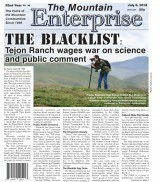 The Governor helped Tejon Ranch obtain the Wildlife Conservation Board payout of $15.8 million in taxpayer funds. The Regional Planning Commission hearing will be held July 7, 2018 in downtown L.A. (at the Hall of Records, 320 Temple St., Los Angeles 90012). You can participate by making public comment there, or at the satellite video conference site being provided at the Lancaster Library (601 W. Lancaster Blvd., Lancaster). 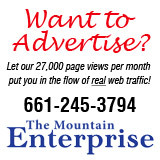 The e-Edition is available now with full photos and stories at The Mountain Enterprise e-Edition. Select the 2018-0706 edition. 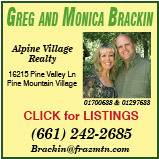 This is part of the July 6, 2018 online edition of The Mountain Enterprise.